Tessellate is proud to announce that our Co-founder and President, Emily Conrad, had a successful session at the Museum Association of New York's 2019 Annual Conference! Emily co-presented alongside one of our current clients Rod Howe, Executive Director at the Tompkins History Center and David Furber of Gorges, Inc. The session, The History Center in a New Context: Innovative, Immersive, and Interactive focused on the collaboration and process the design and client team experienced to create a dynamic, engaging, physical and technical environment that allows The History Center to better fulfill their mission and vision. We were very excited to be a part of this conference and are looking forward to next year! Tessellate is excited to announce our Co-founder and President, Emily Conrad will be a speaker at the Museum Association of New York's 2019 Annual Conference in Cooperstown, NY. The session, The History Center in a New Context: Innovative, Immersive, and Interactive will focus on the process the design and client team undertook to create a dynamic environment that allows The History Center an engaging physical and technical platform to better fulfill their mission and vision. 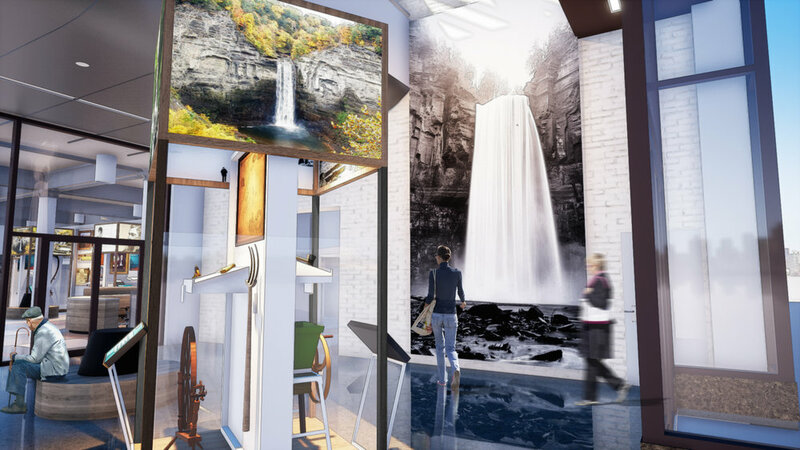 Emily will discuss the collaboration with The History Center in Tompkins County and the partners of the Tompkins Center for History and Culture slated to open Spring 2019. Emily will be co-presenting with Rod Howe, Executive Director of The History Center in Tompkins County, Susan Holland, Executive Director of Historic Ithaca, and David Furber of Gorges, Inc, the project’s software development firm. MANY represents New York State's museums, historical societies, zoos, botanical gardens, and aquariums. We are excited to be a part of this conference because MANY's mission to inspire, connect, and strengthen New York’s cultural community statewide by advocating, educating, collaborating, and supporting professional standards and organizational development lies closely to Tessellate's work. At Tessellate, we believe your museum's artwork and artifacts are part of the institution’s larger narrative, and that objects in a collection are the outcomes of ideas deeper than face value. The objects and artwork represent stories that are evocative of rich histories, bold missions and illuminate concepts relevant to visitors today. 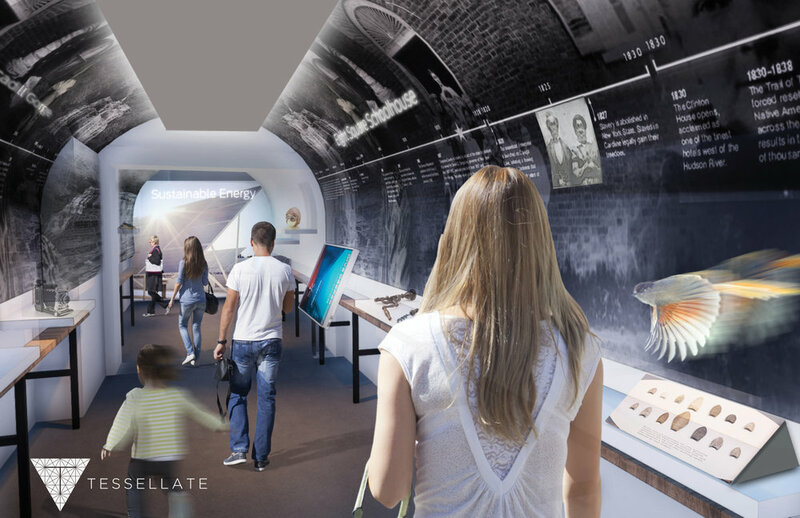 Because we believe in the power of museums, and the power of objects to tell impactful stories, we have created a technology solution for museums to bring their collections and exhibits to life. This includes smart cases, interactive exhibit explorers, and moving images that tell the narrative beneath the objects and artifacts. The stories your audience wants to hear and connect with. Mobile Food Lab Opens its Doors! The Mobile Food Lab opens its long-awaited bus doors to students this October! For our client, the Reed Foundation and GreensDoGood, Tessellate provided a turnkey design and build solution for this experiential vehicle centered around food literacy. Food literacy teaches kids where food comes from, how it nourishes and impacts us, and shapes our world. Aboard this bus children from grades K through 8 get to learn about key themes of Food Science, Urban Agriculture, Creativity and Cooking through hands-on activities - within in a flexible and accessible experiential vehicle. Through multi-sensory, interactive stations Tessellate's goal is to harness students innate curiosity. Find more details at www.mobilefoodlab.org. Emily Conrad, Co-Founder and President of Tessellate Studio, will be giving a talk on New Methodologies in Exhibit Design: Start Up Practice Perspective at SEGD's Exhibit and Experience Design Conference in Washington, DC. August 23rd. With so much to share about growing Tessellate these past two years, participating in NEW INC's incubator for new practices in art design and technology, Emily will talk about what it means to be a start up in the design industry, how to stay focused on what really matters - making the human connection. We look back to 2017 with thanks and gratitude, and look forward to sharing a bright and creative 2018! The BioBus launch was celebrated last night in Harlem at the Jerome L. Greene Center, which is part of Columbia's Manhattanville campus and home to the BioBase Harlem. We were thrilled to be alongside scientists, donors, and families as part of the festivities. Seeking to create a mobile lab prototype to support their new model for STEM education, BioBus asked Tessellate to plan and design their innovative community laboratory outfitted in an Airstream trailer to serve as the next generation of BioBus’s growing fleet in New York City . BioBus is the first of it's kind hands-on mobile laboratory equipped with high tech science equipment, microscopes, and expert scientist ready to share their passion for biology. This open-ended, exploratory environment required Tessellate’s design team to develop a tightly integrated physical, technical and experiential design from the inside out. Tessellate developed the new visual identity, including the logo, pattern design, and environmental graphics that are expressed throughout the surfaces and physical elements of the lab. Fabrication services provided by Ultimate Airstream. This summer, Tessellate's Co-founder Joe Karadin was honored to host ten students from the Zhejiang University of Technology School of Art for an Introduction to Exhibition Design Summer seminar class at the Fashion Institute of Technology Exhibition Program in New York City. The week long class included an overview of exhibition design and two assignments centered around the theme of Curiosity and Constraints, two of the more important aspects of exhibition design. The students did an amazing job of exploring New York and finding things that sparked their curiosity and changed the perspective on how the see and interpret the world around them. The second assignment Pen and Paper explored the notions of designing with constraints and using your powers of creativity to solve for limited design constraints. Joe was excited to have had the opportunity to share his extensive experiences as a designer with this wonderful group of future designers. Special Thanks to Brenda Cowan, Christina Lyons, (Iris) Pan Chen Qi. (for her patience in translating), (Renee) Ren Yi and of course our ten amazing students. The BioBus is live! And ready for visitors to the mobile lab. What we love about BioBus is that it's the first of it's kind hands on mobile laboratory equipped with high tech science equipment, microscopes, and amazing scientist ready to share their passion for biology. Biobus a break from traditional education and science classes, and inspires budding scientists. Tessellate was fortunate to work with the BioBus team on their new logo, visual style and redesign of the bus, which is now a high tech Airstream trailer. From start to finish, inside and out. Tessellate is thrilled to be a member of the New Museum's Incubator program, New Inc. We have exciting plans to rethink the model of museums, the dissemination of information, and how relevant, topical information is accessed through experiences. Come visit our new workspace on the Bowery! "NEW INC was founded by the New Museum in 2014 and is the first museum-led cultural incubator dedicated to supporting innovation, collaboration, and entrepreneurship across art, design, and technology." Learn more about New Inc.